Walter Russell Silva died on Thursday, December 29, 2011, at Martha’s Vineyard Hospital. He was 85. Walter was born at Tea Lane Farm in Chilmark on July 13, 1926. He was the son of Joseph and Virginia Silva. Walter enlisted in the US Army at Fort McClellan, Alabama, on August 31, 1945, and was honorably discharged on November 12, 1948. While in the Army, Walter was stationed at AGRC Fontainebleau Depot in Fontainebleau, France. Walter met his wife Lucette in Fontainebleau at the end of 1946 and got married on August 11, 1947. In 1948 they left Fontainebleau by train to Bremerhaven, Germany. It took them ten days to cross the Atlantic to reach New York. 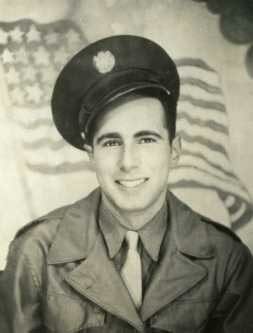 Walter then served at Camp Kilmer, New Jersey, until he was discharged. They settled on Martha’s Vineyard. Once here, Walter worked at Tea Lane Farm, Seven Gates Farm, at the Airport as a mechanic as well as at Alley’s Auto. In 1967 Walter became the superintendant at Seven Gates Farm until 1992. Since retiring he would be seen mowing fields with his tractor. In addition to his wife, Lucette, he is survived by his children: Reginald Silva and his wife, Darlene; Rosemarie Deslauriers and her husband, Carl; and his grandchildren, Tobias and Deborah Silva, Joshua and David Recave. Walter was predeceased by his son Russell in Febuary 1990. His graveside service for the burial of his cremains will be held in Abel’s Hill Cemetery, South Road, Chilmark on Friday, January 6, at 11 am with military honors provided by the Veterans of Martha’s Vineyard. Papa, Dad thank you for all the awesome memories, we will always love you. Memorial donations may be made in his name to the Tri-Town Ambulance, P.O. Box 340, Chilmark, MA 02535; Up-Island Council on Aging, 1042 State Road, West Tisbury, MA 02575 or St. Jude’s Children’s Research Hospital, 501 St. Jude’s Place, Memphis, TN 38105. Arrangements are under the care of the Chapman, Cole and Gleason Funeral Home, Edgartown-Vineyard Haven Road, Oak Bluffs. Please visit www.ccgfuneralhome.com for online guest book and information.